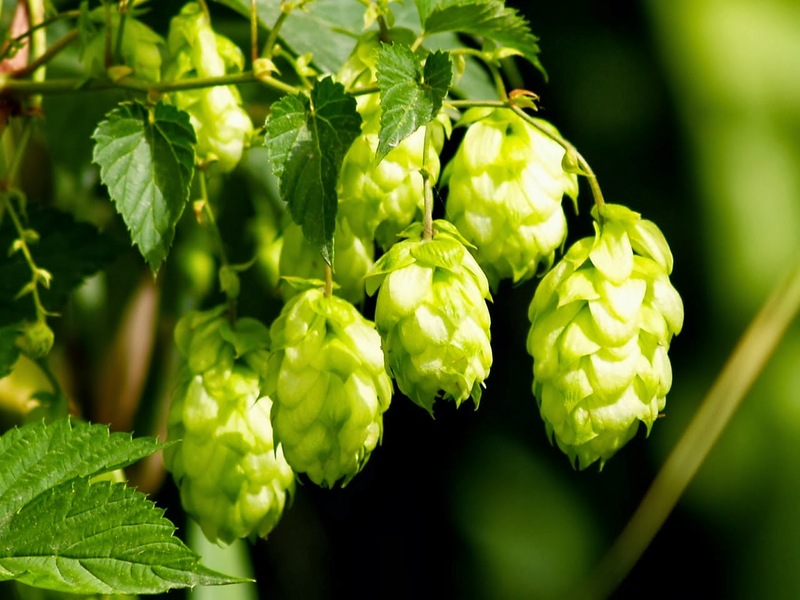 In any beer discussion these days, the topic of hops always comes up. Lots of terms get tossed around, usually connected to the brewing process but also exotic names of older, Noble European versions (Saaz) and new world varietals (Nelson Sauvin). What's it all mean, Alfie? 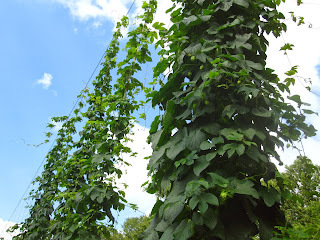 So, in the interest of providing a little clarity, I'm offering today's post which is all about hops, glorious hops! Two important things to know. These cute li'l cones contain glands that produce Alpha acids which provide the bitterness and Beta acids which make the beer smell and taste good... or hoppy! Another thing to know: Hops don't grow on vines, they grow on bines. It's true, you can look it up: http://en.wikipedia.org/wiki/Humulus. Look! Over there. Those hops are growing on bines, supported with trellises. These were found at Wicked Weed Brewing in Asheville. 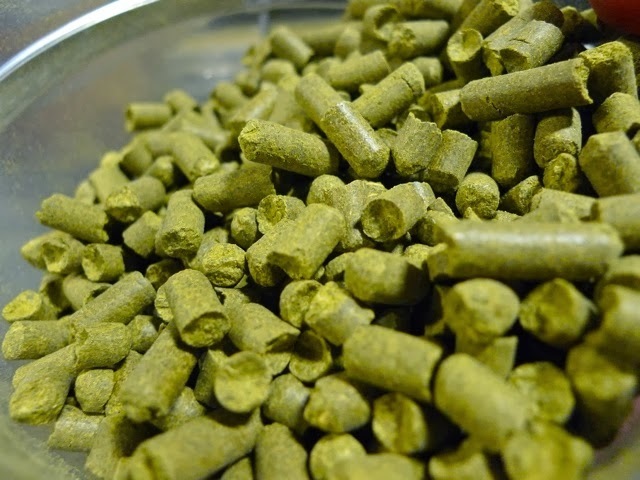 Dry Hopping means that additional hops (high in beta acids) are added after the boiling and fermentation process to regain flavors and aromas that are lost during the boil. Whole cone, crushed or pellet hops may be used. We hop heads like dry hopped beers a lot. In the photo over there, Sierra Nevada Brewmaster Steve Dresler is sampling a beer from a fermentation tank, and if you look closely you'll see a small sign that indicates dry hopping is taking place. Steve told me that inside the fermenter is essentially a teabag-like device (hopbag?) filled with hops that was added to the tank for an unspecified length of time. Wet Hopping (sometimes known as fresh-hopping) is a much more difficult procedure which requires the fresh, non-dried hops to be added within hours of harvesting. This assures the brewmaster of getting the most pure hop aroma and flavor available from the volatile acids. Obviously, only breweries with easy access to hop fields will try this style of hopping. Beers made this way are usually hard to find, but worth tasting when you do find one. The most common form of hops for brewing, especially the home brewers is the dried pellet version, shown in the photo to the right. Another common version, especially for large breweries is the whole cone, usually crushed into bales but easily separated for use, like the Cascade hops I am holding in my hand. I was in the Sierra Nevada hop storage room (very chilly) and the smell was just amazing... the purest aroma of hops I had ever experienced. Makes me wish I had "scratch and sniff" capabilities for this blog! Larger view of the Sierra Nevada hop room, with a bin of Cascade waiting to be used. Scott the tour guide is about to show us a sample. I'm gonna bring this session to a close even tho there are still some terms yet to be described... another day. It's lunch time and I have a grilled lamb sandwich and a Sierra Nevada Ruthless Rye awaiting. Leave comments about any questions you might want answered about using hops. Hops on their Bines. A lovely sight, for sure.